Bengaluru: The Comptroller and Auditor General has accused the state Department of Forests of fudging facts regarding its management of National Parks and Wildlife Sanctuaries in the state. 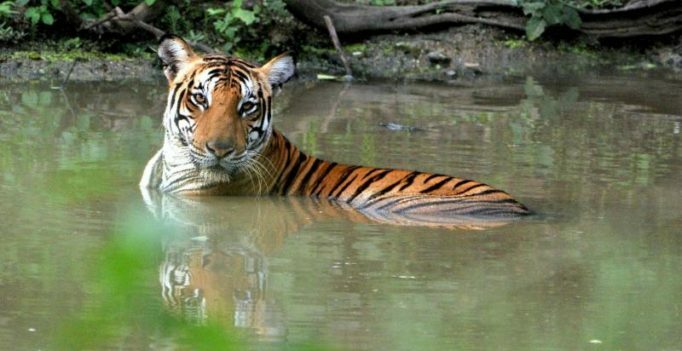 The report has noted that as per National Tiger Conservation Authority, of the 26 tigers poached in the country during 2011-16, nine were from Karnataka. However, the details furnished by the Forest Divisions indicated only one case of tiger poaching during the same period. “A total of 50 road-kills were recorded during the five year period in the 14 sampled Protected Areas of which no recordings were noticed in five Protected Areas. This stood in sharp contrast to the fact that a 45-day monitoring by the Kudremukh Wildlife Division indicated 1,338 road-kills,” the report stated. In and around six Protected Areas, 51 resorts and hotels and 50 homestays were operating, out of which, 44 resorts/hotels and 15 homestays had not received Forest Department approval, the report stated. “Of this, four resorts were located in the elephant corridor and five resorts/hotels were found to be functioning inside enclosures contrary to Wilderness Tourism Policy. A coffee plantation located inside Biligiri Ranganathaswamy Temple (BRT) Tiger Reserve was operating beyond the lease period,” the report noted. And what is even worse, the encroachment of forests in Karnataka, which only 19% of its area under forests, against the national average of 21%, is only increasing. “The encroachment of forests in Karnataka increased from 42,518 acres to 2,04,442 acres between 1995 and 2014. In 14 selected Protected Areas, 4,393 families have encroached upon an area of 9,524 acres as of March 2016, but only 1,384 forest offence cases were booked. In respect of Bandipur and Nagarahole Tiger Reserves, it was noticed that extent of encroachment was short reported by 1,686 and 148 acres respectively,” CAG has noted. Though an action plan had been submitted to High Court of Karnataka to evict encroachments to an extent of 1,041 acres by July 2015, the encroachment cleared was just 469 acres. Against a total of 2,510 applications received for rehabilitation/relocation in four Protected Areas, only 1,357 families had been rehabilitated. The delay in rehabilitation in Bhadra Tiger Reserve was mainly on account of non-availability of funds. The country’s top auditor noted that for the forest fires which occurred during 2012 in Bandipur and Nagarahole Tiger Reserves, the burnt area assessment done by the divisions was very conservative as compared to the reported assessment of Principal Chief Conservator of Forests. Similar under-assessments were also observed in Nagarahole Tiger Reserve during 2014 where the initial assessment of 60 hectares was later enhanced to 179 hectares based on ground truthing. The revised assessment was almost equal to the satellite based assessment of 172 hectares. “Administration of National Parks and Wildlife Sanctuaries in Karnataka, being an important activity for better maintenance of Protected Areas, was not given adequate importance. In respect of permissions accorded for research/studies inside Protected Areas, as against 129 permissions including 18 ongoing projects, reports were received in respect of only nine projects. Though data on some species such as tiger, elephants, leopard and lion-tailed macaque were available, the Protected Areas did not have data on other lesser known mammals,” the report noted. In a veiled questioning of the priorities of the Forest Department, CAG noted that the forest area per personnel was higher for other Protected Areas than the Tiger Reserves. Out of 401 arms supplied to staff in Protected Areas, 156 were not functional and out of 1,187 wireless sets supplied, 355 were not functional. Though invasive alien weed species like Lantana camara, Parthenium, Eupatorium, Chromolaena odorata had become major threats in six Protected Areas, no major initiatives were taken to address the problem, it noted. “Human Wildlife Conflicts continued to be a major concern and the mitigation measures undertaken by the Forest Department did not have any major impact. Elephants require large feeding ranges and use specified migration paths for movements which are affected by fragmentation. The increased agricultural/ developmental activities also contributed to Human Wildlife Conflicts. To reduce such events and as a long term measure, corridors connecting forests is the need of the hour. Five such corridors were identified for strengthening in the Western Ghats-Nilgiri Biosphere Reserve region, more than a decade ago, but their strengthening had not fructified,” the report stated. The report for the year ended March 2016 has been prepared for submission to the Governor of Karnataka under Article 151 (2) of the Constitution of India for being laid before the State Legislature.